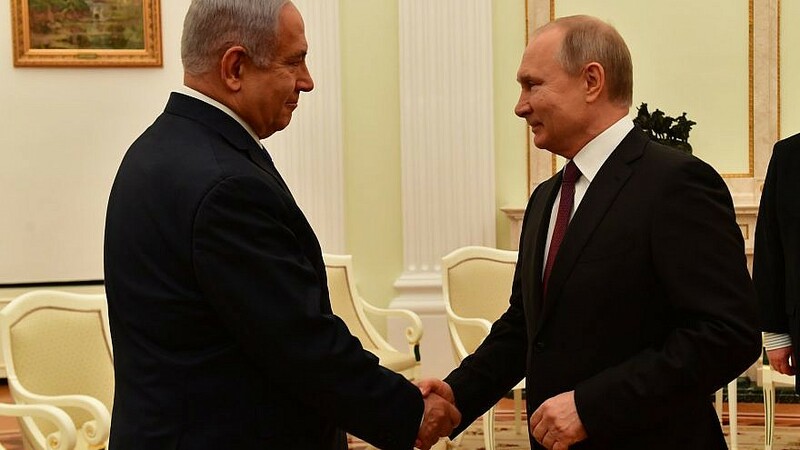 (April 4, 2019 / JNS) Israeli Prime Minister Benjamin Netanyahu met with Russian President Vladimir Putin in Moscow on Thursday, just days before Israel’s general elections on April 9. In their public remarks, the two leaders discussed Russian assistance in helping to recover the body of Israeli soldier Zachary Baumel, who was killed during the 1982 Lebanon War. “Two years ago, I turned to you with a personal request—that you help us in finding the remains of the soldiers, including Zachary Baumel, out of the great shared values of comrades-in-arms and fellowship of soldiers. You responded immediately. You said that you would act personally,” said Netanyahu. Ahead of his departure for Moscow, Netanyahu said that he would discuss the situation in Syria, as well as the coordination between the Israeli and Russian militaries. Despite differing priorities in Syria, Netanyahu has been determined to maintain a warm relationship with Putin. Israel has been pushing Russia to do more to contain Iran’s presence in Syria, which the Jewish state considers one of its top threats. Netanyahu’s meeting with Putin also comes amid a flurry of diplomatic activity with top global players ahead of Israeli elections. Late last month, Netanyahu met with U.S. President Donald Trump in Washington, where the American leader announced U.S. recognition of Israel’s sovereignty in the Golan Heights. He also hosted newly elected Brazilian President Jair Bolsonaro in Jerusalem.